We´re sending our most recent newsletter to you now. Fear. Without exception we have all experienced fear to some degree. Anxiety, which is basically the malfunctioning of our brain’s fear circuitry, accounts for 75% of mental illness in the world today. Mental health is not a one size fits all industry and finding a therapist or psychologist for yourself or a loved one can be overwhelming. What suits one person and their particular issues may be an ineffective solution for someone else. Select Counsellors has developed a convenient over the phone assessment process ($55 incl GST*) whereby we interview you in detail about your particular issues, requirements and history prior to matching you with your best fit mental health practitioner. Tell me more. At Select Counsellors we have an extensive network of experienced psychologists, counsellors, psychotherapists, social workers and life coaches who specialise in many different issues and work in many different ways. Research has shown tfinding the right mental health practitioner for you is the most important element for a successful outcome. Tell me more. You might be interested to know that research suggests those people who have an issue and seek therapy are 80% better off than those who don’t undertake treatment. Once we match you with a therapist we will check in with you regularly to ensure the therapy is working and you are getting the results you are looking for. What makes Select unique ? Unlike others we do not match purely on locality and gender. Our CTM assessment process is based on extensive research and takes into account your goals, needs, current circumstances, life history, learning style, personality and other preferences. Tell me more. We guarantee to get the matching process right That means if the therapist we find for you is not working out we will work with you and find you a better match. Our services are delivered using a flexible range of options to best suit your needs. We offer online, phone, & skype sessions as well as face to face. Your security/confidentiality is our priority. All clients using our services are given their own password protected page. 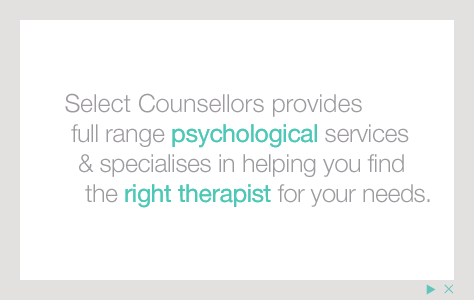 All communications to and from PsychSelect and your therapist will take place on this page. The online booking system for sessions and assessments is under construction. In future you will be able to book face to face, online and phone sessions and assessments from this page. We identify a shortlist of two potential therapists best matched to your goals, needs, personal requirements, learning styles and other preferences. Of course things like location, cost and gender are the easy ones. But specialist areas, methods and ways of working, personality aspects and other individual differences are the most integral to our matching process. *AUD: Prices are displayed in the currency in which the transaction will be processed. All transactions are done in Australian Dollars and/or are subject to conversion to Australian Dollars Currency.